After purchasing our 1950's home, I decided to finish the basement. 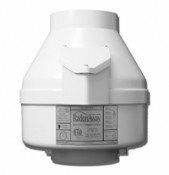 However, when I tested it, our basement had a radon reading of 6.4 (I wish I had tested the home before we bought it - live and learn). And our main living level tested right at 4.0. 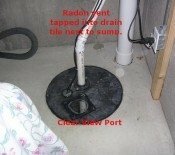 So I decided to try to mitigate the radon issue on my own. I used some some dimple membrane to seal out a drain channel along the walls of my basement for the previous owner's installation of an internal french drain sump well system. I also sealed my sump well using products from Val's web site. I hoped that this would be enough to get us below the 4.0 level in the basement, but unfortunately it did not (got it in the 5.x range). So with Val's web site, guidance and design advice, I added a RP140 fan which draws air from our sealed sump well through a 4" PVC sched 40 pipe. Our radon level is now 1.4 in the basement and 0.9-1.0 on our main living level. What a difference the fan has made. Now I can feel good about finishing my basement remodel and have my family use the space on a regular basis without radon-related health concerns. Thank you Val!